What is your favorite holiday food? With so many dishes to enjoy, it might be easier to list the foods you don’t like instead. Holiday feasting is great fun but too many cups of eggnog and slices of pecan pie can affect your health. A few latkes here and a few butter cookies there can mean too many pounds and extra strain on your heart. You don’t have to cancel holiday celebrations. You just need to add a little constraint to your celebrations. Here are a few tips to help you get through the holidays without jeopardizing your health. Although it may sound logical, starving yourself before a party is not the best plan. It is better to eat a few complex carbohydrates with some protein before you go to the party. If you are famished, it will be harder to control what you eat. When there are many dishes, you need to make a plan to avoid overeating. Decide which dishes you really want and which ones you can skip instead of trying to eat them all. Try to create a balance between healthy and indulgent. Take smaller portions of sweets. It is fine to cut a piece of cheesecake in half. If there is a buffet, take one plate and then move to the other side of the room. Limit the number of return trips to the buffet. Eating slowly will allow you to savor the delicious treats and give your stomach the 20 minutes it needs to send the message to the brain that it is full. A great way to slow your pace is to visit with others between bites. After all, a holiday party is a time to reconnect so after you finish a bite of that amazing roast, ask your friend how life is going. Be cautious with alcoholic drinks during the holidays. Alcohol increases your appetite and diminishes your ability to know when you have had enough to eat. Drinks can really pack on the calories also. That creamy eggnog can add 500 calories and those mixed drinks and beer add 150 to 225 calories. Try to enjoy one drink and then switch to water. It is okay to enjoy a delicious treat once a year but savor it and then don’t take more. Avoid the “it’s too late now” approach to the holidays. If you eat a big meal one day, eat lighter for the next few days. Don’t make food and drink the focus of your holiday celebrations. Focus on family, friends, and good cheer instead. 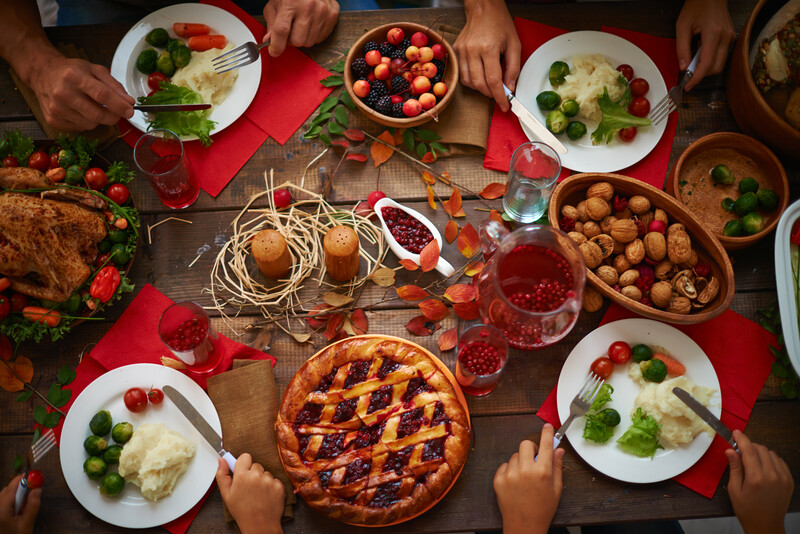 There are many holiday dishes that are healthy so offer to bring one to a family gathering so that you and others have a nutritious option at the table. When having guests to your home, think about their well-being by offering low fat, low calorie options along with the other dishes. There are other ways to show love than with sweets. Whether it is the holidays or the new year, eating well is important. No one knows what health challenges await them but eating healthy will always provide you with the fortitude to stand strong. Whether you have a planned joint replacement surgery in your future or experience an unexpected medical event, being in top shape provides an advantage. When medical challenges do arise, consider continuing your resolve to stay healthy by choosing to recover at Whitehall of Deerfield where you will find the medical and physical assistance you need to get back to your normal life. Whitehall of Deerfield, the area’s premier post-hospital rehabilitation center, has consistently received Medicare’s highest rating in Medicare’s five-star rating system of nursing and rehabilitation centers, making it one of the best options for recovery in the area. The expert staff is dedicated to providing the highest standards of customer service and clinical care. In addition to exceptional care, Whitehall of Deerfield will provide you with world-class accommodations and amenities to make your stay comfortable. Attentive concierge service, daily delivery of Starbucks coffee and newspaper to your room, valet parking for your visitors, Wi-Fi, in-room dining, and a Wellness Spa are just a few of the many services offered during a stay at Whitehall of Deerfield. Meals from a diverse menu can be taken in the privacy of your room or in the elegant dining room. Gourmet coffee, freshly-baked goods and ice cream refreshments are also available to all guests. The staff at Whitehall at Deerfield strives to address every guest’s needs in luxurious surroundings giving your stay a world-class feel. To learn more about Whitehall of Deerfield, visit whitehallofdeerfield.com or call 847-945-4600.